More navigable waters are a boost for Russian President Vladimir Putin’s effort to expand his nation’s reach in the gas market and for energy companies such as Total SA and Novatek PJSC, which are leading Arctic developments. They also help reduce shipping costs for LNG, benefiting buyers and traders of the fuel from PetroChina Co. to Gunvor Group Ltd. While shorter shipping journeys reduce emissions, environmentalists are concerned that more traffic through the Arctic will add to the amount of black carbon—particles of pure carbon—settling in the snow from tanker smokestacks. When that soot darkens the surface of the ice, it speeds up the warming process by absorbing more of the Sun’s energy. Scientists are seeing a rapid change in the Arctic. The Bering Sea between Alaska and Russia lost about half its ice coverage during a two-week period in February, while the most northern weather station in Greenland recorded temperatures above freezing for 60 hours that month. The previous record was 16 hours by the end of April 2011. The mercury topped an unprecedented 30 degrees Celsius (86 degrees Fahrenheit) north of the Arctic Circle on July 30 in Banak, Norway. 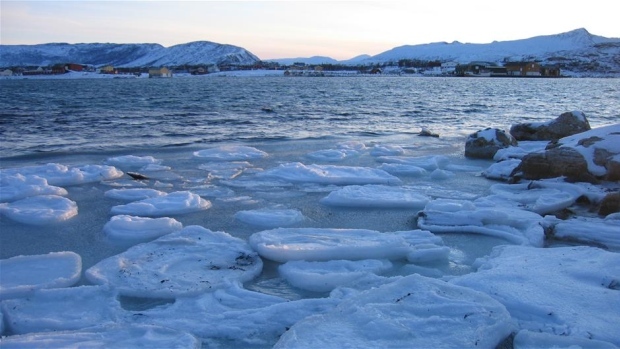 Ice begins melting in the Arctic as spring approaches in the northern hemisphere, and then it usually starts building again toward the end of September as the days grow shorter and cooler. A total of 5.7 million square kilometers (2.2 million square miles) of ice covered the Arctic in July, according to the Colorado-based National Snow & Ice Data Center. Through the first two weeks of August, ice extent declined by 65,000 square kilometers each day, according to the NSIDC. This season is likely headed for the the ninth biggest retreat since satellite measurements began, not as extreme as bigger melting seasons in 2012 and 2007, according to Julienne Stroeve, Professor of Polar Observation & Modelling, University College London. Routes like that may save Yamal $46 million in shipping costs for the remainder of the year, those savings could quadruple by 2023, Bloomberg NEF said in a note. Traffic is picking up. The Northern Sea Route saw 9.7 million tons of cargo shipped through it in 2017, according to the Russian Federal Agency for Maritime and River Transport. There were 615 voyages along the Northern Sea Route this year through July 15, about the same as in 2017, said Balmasov at Arctic Logistics. The Russian government is targeting cargo traffic through that route totaling 80 million tons by 2024.